SurfaceProartist.com is reporting a review for a relatively unknown new Cintiq competitor called the ThinkVision LT1423p Touch Mobile Monitor and while they seem to like it more or less there are other reviews on the Lenovo forums are iffy. I will say that some of those reviews seem to stem from not understanding the device. The ThinkVision LT1423p is a 13″ penabled touch screen tablet which you connect to your PC or Mac to draw on much like a Wacom Cintiq albeit smaller and not as reliable as you’ll see below. The device apparently uses two USB3 to power it so if you don’t HAVE USB 3.0 you’re done with this mini review right now. It also appears to work wirelessly but the reviews on that were poor so I wouldn’t trust it. The pen is total crap (like the Lenovo Helix’s) too but I would imagine any Wacom penabled pen will work so that’s a relative non issue. I have always been impressed with Lenovo’s build quality and the video supports this. The video reviewer talks quite a bit about troubles with the drivers, which is odd to me since Lenovo usually places quite a bit of attention to detail with their own software. This makes me feel like it’s almost a throwaway device and they don’t support it much which worries me a bit. I’m actually pretty impressed with the drawing lag or lack thereof, which seems to be very low if you check out the video at around 10:29 or this point and it’s one of the reasons I’m even pointing to this device at all. The corner tests seemed good as well, and what I mean by that is that you can draw all the way to the very corner of the device without losing connection of th pen or having the cursor stray from the pen’s point which isn’t always the best even on Cintiqs I’ve tried, especially the 12″ one. This being a touch enabled monitor, I’m pretty sure the Palm rejection is crap since no one seems to be able to get that right yet. Luckily on a PC it’s sort of a non issue since you can disable to Touch driver, but on the Mac, I’m not so sure how you’d disable it but you could use a Smudgeguard glove to disable the touch which is actually a decent tradeoff and works beautifully. The forums led me to the Youtube video above which were fairly positive albeit some hiccups with driver issues. 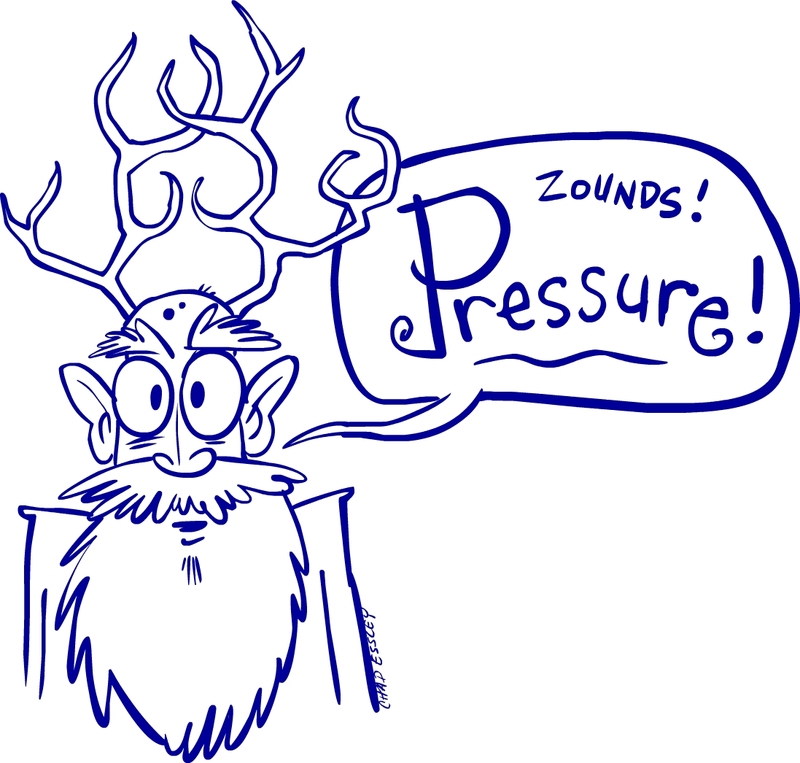 “I’ve confirmed pressure sensitivity works in Photoshop, Sketchbook Pro (x86), Paint Tool SAI, OneNote, Sticky Notes, and Sculptris. I’m guessing this isn’t much of a surprise for any of you. All in all, this seems like a solid product. I have an Intuos 4 Large and use the monitors shown in the youtube video as a reference to measure my subjectivity. The screen looks great, and is responsive. I have detected some parallax effect, but that was anticipated. It is worse when the stylus is not tangent (90 degrees) to the tablet surface. In fact, I was pleasantly surprised by how little the offset was after calibration. My biggest hardware complaint I would have to be the dinky stylus, but thankfully other compatible ones are available. You can read more of that discussion here. All in all it seems like if you can get past the driver issues at $600 bucks, it’s a decent alternative to a Wacom Cintiq. You can buy a ThinkVision LT1423p here on Amazon. 2014 is already an interesting year for digital artists and animation professionals as far as technology advances in the tools of our trade. Of particular interest to artists: the large size, high quality screen and built-in Wacom (S-Pen) technology used throughout Samsung’s Galaxy Note line. By far the most striking feature of the Note Pro is the screen. At 2560 x 1600 (247ppi) the screen is beautiful to look at. Colors are vibrant, with nice inky blacks. For displaying high-resolution artwork, photos and movies, the Note Pro excels. In fact, watching HD video on the Note Pro is probably the pinnacle of tablet entertainment. The Note Pro’s screen almost perfectly matches the size of a standard comic book. Reading digital comic books on the Note Pro is a joy; you’re able to read a full comic page with no zooming/scrolling. Above left with an actual comic book over the screen. Holding the device in portrait mode for comics, magazines and books does make the device’s downside readily apparent; it’s heavy! Held in portrait, the full mass of the tablet bears down on your hands for any extended length of time. The tablet is far more comfortable to hold in landscape mode, and it seems made to be oriented this way most of the time.The Note Pro’s screen is so large that I found reading in landscape as two-page spreads to be perfectly comfortable, with only a modest amount of zooming and scrolling needed for digital comics and magazines. But how does the Note Pro stack up for artists? The answer depends on your needs, and what technology you may already be used to for creating digital art. If you require an experience rivaling a full Wacom Cintiq setup, with a slew of desktop-quality applications, then the Note Pro is definitely not for you. However if you can cope with the trade-offs of a mobile operating system (Android) or are already using an Android device to create artwork and do productivity tasks, then the Note Pro will easily be the BEST Android device you’ve used. If you’re already in the market for an iPad Air, or other 10” Android tablet and want the added benefit of drawing with a Wacom digitizer and pressure sensitive pen, then I’d highly recommend the Note Pro. It does a great job of bridging the divide between premium media consumption vs. light productivity and content creation. I use the Note Pro 12.2 to view PDF storyboards. All-in-all, I’d say Android is in its infancy for producing finished, professional quality artwork. The closest competition to the Note Pro, (in the race for an iPad-like sub $1000 Wacom-enabled tablet for producing professional artwork) is Microsoft’s Surface Pro 2. For drawing, the Surface Pro 2 is the better choice, certainly in terms of software since it can use desktop Windows software. That said: the Note Pro is an amazing tool for artwork and productivity in its own right. The key is navigating Android’s minefield of applications and separating the quality apps from junk. Another factor is improving the tablet’s included S-Pen. (Which I will outline.) With the best creative software Android has to offer, the experience of sketching and drawing on the Note Pro is very good. A few apps manage to achieve a low enough latency that the feel rivals last-generation tablet PC’s. 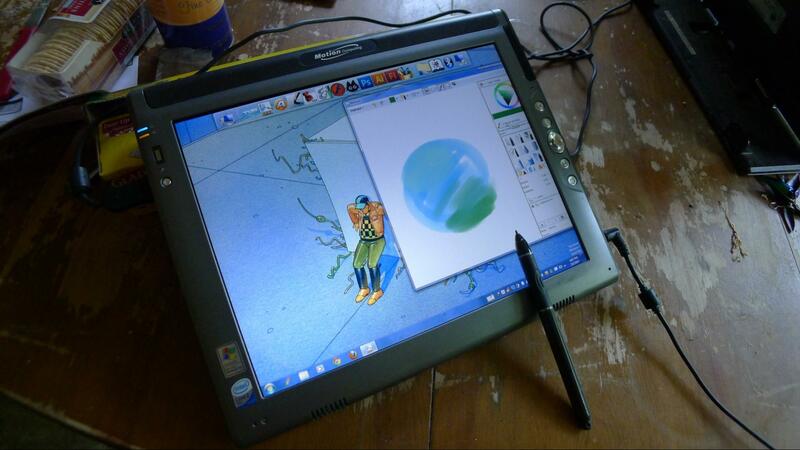 (For example, I find drawing to be similar to a Motion Computing LE1600 Tablet PC of 2007 vintage.) Compared to the LE1600 (and most last-gen Tablet PCs) the Note Pro is light as a feather. So to achieve near the same level of drawing performance in a lighter package (relatively speaking) is a major plus. Also, keep in mind the bang-for-buck mobile applications give you. Many quality applications can be had for $3-$5. Quality desktop applications usually start much higher, and can skyrocket into the thousands Samsung includes $25 in Google Play Store credit with the Note Pro, so you can go shopping for some of the apps you will need on their dime. Included with the Note Pro. Don’t bother to install SketchBook Pro for Android in place of it, according to Samsung these are virtual identical apps, but Sketchbook for Galaxy includes some under the hood fine-tuning that’s specific to the Galaxy Note and S-Pen hardware. The mobile version of Sketchbook Pro is fairly barebones compared to its full desktop counterpart, but enough features are intact to produce decent artwork. Out of the box, I was a little disappointed with Sketchbook Pro on the Note Pro; I was looking for the feel of it to be more accurate, closer to the feel of pencil/pen on paper. But some fine-tuning and modifying of my S-Pen improved the experience greatly, enough that I wanted to outline a few basic procedures you can try yourself to improve the sensitivity of the S-Pen. (Later in this article). Once I took these steps (as well as tweaking my brush and pen settings in Sketchbook) I found the results very satisfying. This is a one-trick pony to be certain. It has no features, other than 10 pen settings that simulate inking styles. The latency is surprisingly high. Still, I was able to easily do some very fine line cross-hatching using the pressure sensitive pen setting. Since it uses vector lines, you can create artwork that looks great at even the highest resolutions. This was a pleasant surprise for me. I find it has the lowest latency of any drawing app I’ve used on Android. Drawing with it feels very natural. The free version lets you use a small selection of customizable pens and pencils; the paid version adds an assortment of paintbrushes, airbrushes, rollers and pattern pens. The Pro license also allows export to PSD with layers. So far, this has been my go-to app for drawing on the Note Pro. A very nice drawing app with some of the most realistic colored pencil and watercolor effects I’ve seen for Android. Minimalist interface and controls, but there’s plenty to work with, including the ability to import photos. Optimized for S-Pen and good palm rejection. 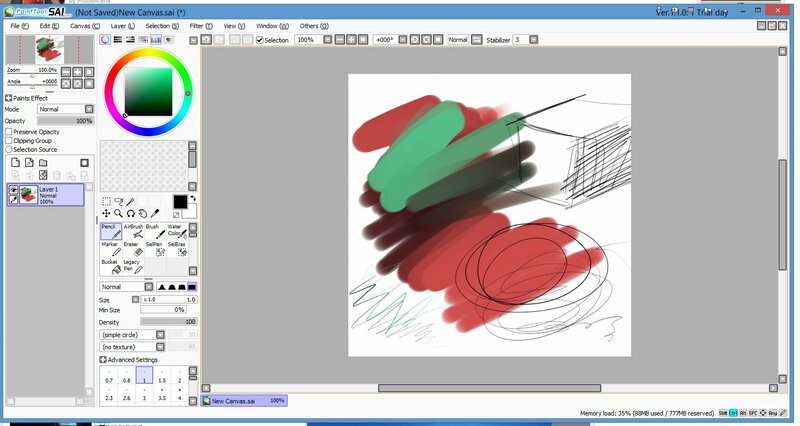 This is probably the closest thing to Painter or ArtRage on an Android tablet. The latency is a little high, but not enough to prevent creating nice work with it. The free version is fully functional; the paid version adds on the ability to tweak and customize brushes to your heart’s content. My favorite feature is a full-screen color palate, called up from a corner button. The ‘color sweep’ function allows you to paint with up to 5 palette colors at once. The latency is a little high, but this app makes up for it with a huge assortment of brushes, paint blending and mixing, wet and dry effects, unlimited layers and S-Pen optimization. You can import photos or drawings and paint over them. The ads plastered across part of your canvas will have you either uninstalling it, or ponying up for the $4.99 ad-free Galaxy Note version. A really nice app for drawing using flat colors. I was really impressed by the fairly low latency and S-Pen optimization and great pressure sensitivity response for accurate lines. In particular, I like the controls for precisely changing brush thickness variation. Ported over from the iPad, this software is more fun than it is useful for actual production. Still, it’s a great way to do quick pencil tests. The interface is an approximation of an animator’s light table, with peg bars and onion skinning a user-selectable range of frames forward and back. There’s no pressure-sensitive pen support so the drawing tools are pretty rudimentary. Also the resolution is fairly low. Still, it’s a fun app to play around with. This is a great app for pencil test animation. The tools and frame manager are more robust, and it can export your finished animations to file or straight to YouTube and Facebook. The app was built with S-Pen support in mind. The $2.99 unlocker removes ads, gives you improved onion-skin controls and removes the FlipaClip watermark from exported files. It may seem like bloatware at first glance, but S Note is actually a great tool for note taking. Since it’s made for S-Pen, it’s easy to take notes that are true to your handwriting. On the Note Pro’s gigantic screen, it’s truly like a large digital notepad. Notes can be exported to Google Drive and synched to Evernote. Best of all, S Note is Multi-Window capable (as most of Samsung’s native apps are). More on Multi-Window later. Handrite is a notepad that features a unique ‘continuous writing’ system. Rather than write directly on the page, Handrite captures your pen strokes and arranges them in order, like typing into a word processor. I’ve found it makes note taking extremely fast. You simply write in large strokes across an area in the middle of the screen, and the app keeps the output neatly aligned on ruled paper. The paid version allows export to PDF and unlimited notebooks. Unfortunately, it isn’t Multi-Window ready. This is a great app. Papyrus is designed to feel like pen on paper for handwritten notes. I found it fast and accurate for taking notes. Because it uses vector graphics, everything you write or draw remains sharp even when zoomed in. It’s also Multi-Window ready. After registering your device with Samsung’s Apps service, you can download a specialized full version of Hancom Office that’s only available for the Note Pro. Hword is the closest thing to Microsoft Word that I’ve used on Android. 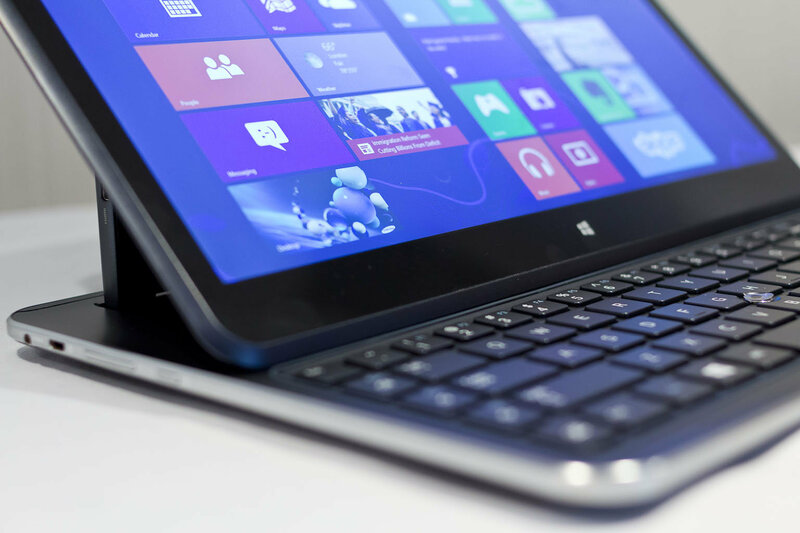 When I paired my Note Pro with a Logitech Bluetooth Keyboard, using Hword felt just like using Word on a laptop. Also included is Hcell for spreadsheets and Hshow for presentations. Add a Bluetooth keyboard and you have a 12” laptop. Currently ZAGG makes a $99 Cover-Fit keyboard and Logitech just unveiled a $130 Pro Keyboard case for the Note Pro. On smaller devices, Multi-Window (running apps side by side in multiple windows) doesn’t seem like such a useful idea. On a 5.5” smartphone I’ve rarely felt the need to use it. But the Note Pro’s screen is so large that Multi-Window is actually a killer feature. Further, Samsung has expanded Multi-Window to four panes from its original two. Multi-Window with 3 applications at once. I’ve used it to have a script open, side by side with an animatic movie, a storyboard PDF and a note pad for jotting down notes. (Papyrus or S Note). Each quarter of the screen is about the size of my Note 3’s entire screen, so even split 4 ways there’s enough room to comfortably view and work on each individual task in each pane. And split two ways, half of the Note Pro’s screen is roughly the size of a full 7” tablet. Multi-Window lets you resize the panes to your liking. The Note Pro’s Exynos Quad-core processor (1.9Ghz) really shines when using Multi-Window. 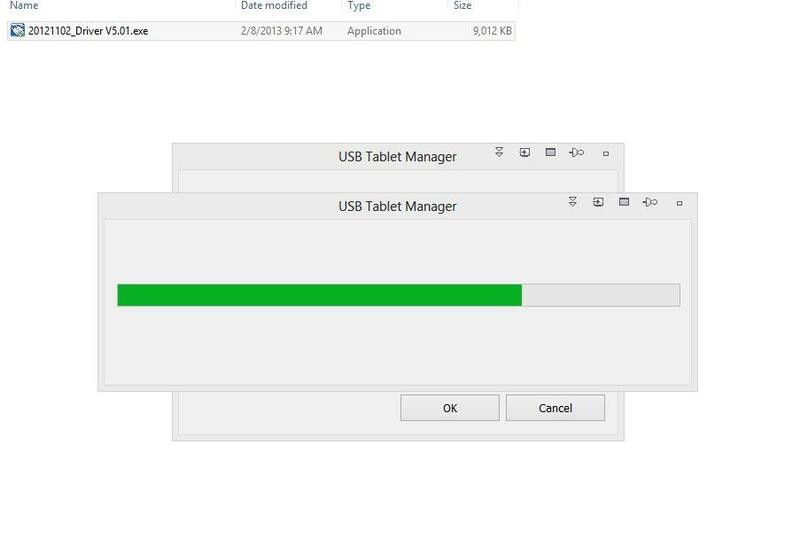 Running multiple windows (with Pen-window apps and videos running over top of that) I didn’t detect any hint of the tablet slowing down in any application. The Note Pro’s S-Pen (black) is slightly longer and thicker than a Note 3 pen. Out of the box, I was slightly displeased with how the S-Pen felt on my Note Pro. Lines were coming out a little too thick, and I felt the pen was over-sensitive, not giving me enough line variance. 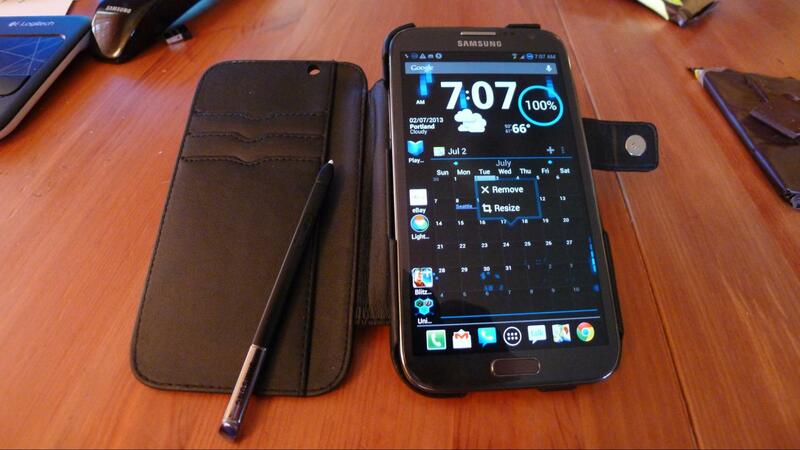 I liked the feel of my Galaxy Note 3 much better. Then I noticed that the Note 3’s pen was just as good when used on the Note Pro, so it was clear the pen itself was the problem. Use an exacto blade or small screwdriver to very carefully pry up the S-Pen’s click button. Do it carefully, it will come up with just a small amount of pressure. Locate the small potentiometer toward the tip of the S-Pen. (DO NOT adjust the one toward the rear). It’s hard to see, but there’s a small slot on top. Use a very small eyeglasses screwdriver to turn the dial: clockwise to decrease sensitivity and counter to increase it. 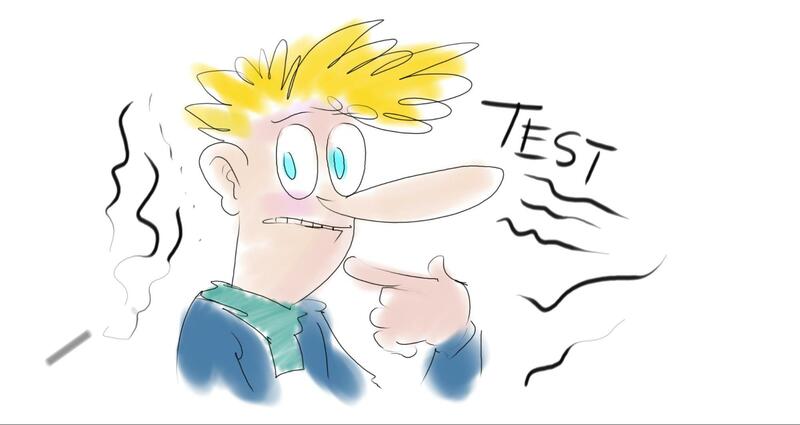 Test the pen on the screen until you find the sensitivity setting that’s best for you. Carefully snap the button back into place. It took some trial and error, but I managed to fine-tune my Note Pro’s S-Pen to the perfect degree of sensitivity for me, allowing finer and more accurate lines. Another issue with the S-Pen led me to a bit of hackery, but I’m very happy with the results. The pen is a bit too small to be the best choice for artwork or extended note taking. I wanted a larger full-sized stylus. Unfortunately, ready-made options are limited. Most ‘penabled’ Tablet PC styluses will work with the Galaxy Note line, as long as they are the Wacom variety. (Note: Wacom Cintiq and drawing tablet styluses will NOT work with the Note). My LE1600’s stylus works with the Note Pro- but there’s a catch. Most of the penabled styluses are a few pixels off on a Galaxy Note; (where you press the screen and where the line is actually drawn is offset by 3-4 pixels.) The difference can be overlooked for simple note taking. But for precise drawing, it’s a deal breaker. Unfortunately, even Samsung’s own $20 8pt Wacom Touch Pen stylus that seems like it should work with the Note Pro suffers from a slight offset. The standard S-Pen is a great stylus as far as function- all it really needs to be more comfortable is a weighted holder. Samsung does make a somewhat pricey S-Pen holder, but there’s also a cheapskate solution that works very well. 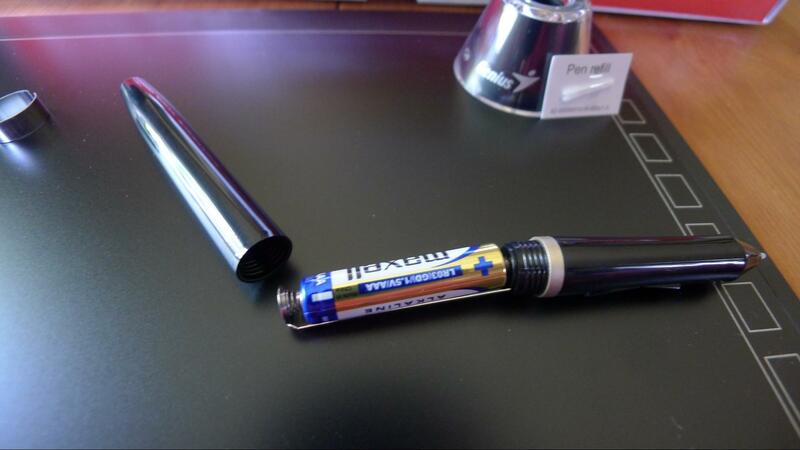 On XDA, I came across a method of repurposing a common Pilot G2 ballpoint pen into a perfect S-Pen holder. 1. A Pilot G2 pen -I used an 07- ($2). 2. An S-Pen replacement from eBay or Amazon. ($8 – $16) Assuming you don’t want to sacrifice the Note Pro’s stylus. Make sure you buy an S-Pen that’s labeled “Original” or “OEM” so you don’t get a cheap knock-off. I found an OEM S-Pen (for Note 3) for $8 on eBay that works perfectly with the Note Pro. Unscrew the G-2 and discard the ink barrel and spring. (I left the clicker as counter-weight). Use a utility knife to very carefully slice about ¼ inch off the plastic tip. Push the S-Pen through the front barrel until it fits snugly, and with enough tip sticking out to write comfortably. If you can live without the click-button, you can screw the pen together and start using your larger stylus. If you want the click button, remove the rubber grip (note: this is hard to do, the grip is on incredibly tightly!) Easiest: cut the rubber grip off with an exacto blade, Later you can replace it with a foam or gel pencil grip. Mark where the S-Pen’s click-button is through the clear barrel. Remove the S-Pen, and (VERY CAREFULLY!) use a utility knife to cut open a corresponding notch in the pen barrel. Easiest: heat the blade with a candle flame to melt the plastic some. Be careful not to melt too much of the barrel and warp it. I used a utility knife to shave down and smooth out the opening. I didn’t do the neatest job of it in the above example, but it doesn’t matter- this is hidden under the gel grip. More advanced DIY’ers can likely use a Dremel tool. Push the S-Pen back in the barrel and line up the opening. Once you can easily click the button, cover with a foam or gel pencil grip. I was easily able to click the button through a gel grip, and a slight indention cues you where the button is. The replacement gel grip is also more comfortable than the G-2’s original plastic grip. I wouldn’t recommend the Galaxy Note Pro 12.2 for artists that require as close to a Wacom Cintiq experience as it is currently possible to get from a tablet. 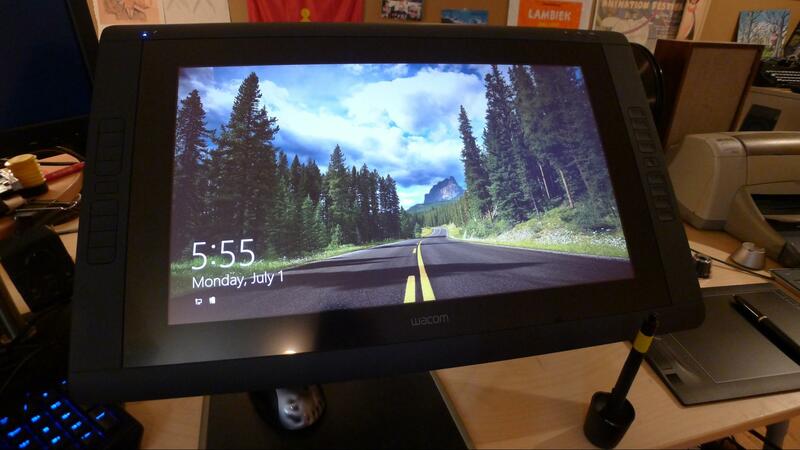 I would instead recommend a Windows 8 Tablet PC with Wacom digitizer like the Microsoft Surface Pro 2 or similar. But for anyone already on the lookout for a tablet like the iPad Air, that you plan to incorporate into drawing and animation work, I would very much recommend the Note Pro 12.2 as a more capable alternative. The larger, higher-res screen and addition of the Wacom digitizer and S-Pen puts it ahead of the iPad for basic drawing tasks. (An advantage for iOS is a greater selection of high-quality tablet applications vs. less selection from Android.) For viewing and editing documents (storyboards, scripts, spreadsheets etc.) taking notes, viewing animatic and other footage while multi-tasking, the Note Pro is a very valuable productivity tool. At its $749 (32GB) introductory price, the Note Pro is expensive, and will keep many away until the price eventually drops. Consider that Samsung also makes the Galaxy Note 10.1” 2014 edition at around $449 that may be a better fit. Samsung’s Galaxy Tab line is less expensive still, but sans S-Pen and Wacom hardware. I wouldn’t recommend the 64GB version of the Galaxy Note series tablets, as each has a microSD slot allowing you to add additional storage. Currently a 64GB microSD card can be found for around $45. The combined 96GB of storage is plenty for movie files, tons of documents, applications, photos and digital media. Harry McLaughlin loves all kinds of gizmos and gadgets. He’s currently an animatic editor on “American Dad” for Fox TV Animation. 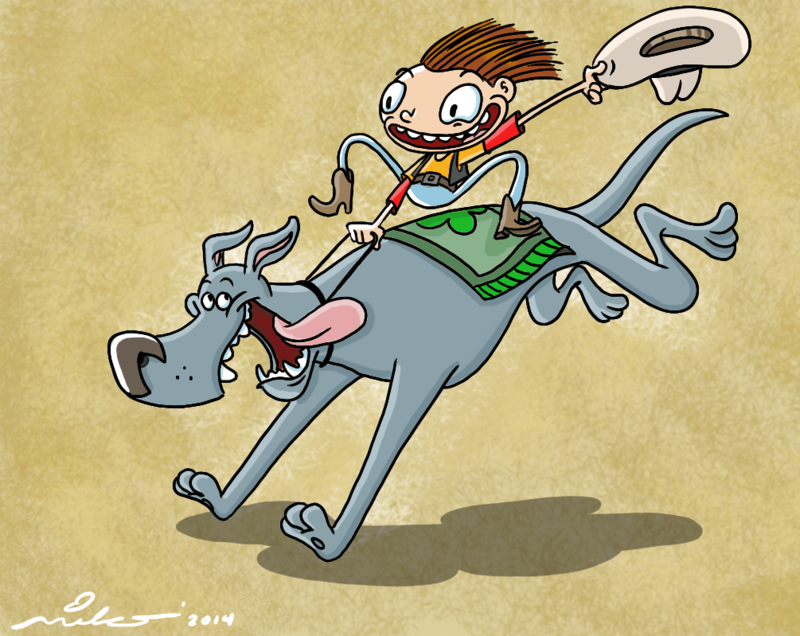 He also dabbles in writing books for kids, as featured on his website Zaptoons.com. You now have no excuse to say you can’t make that film due to lack of funds for software! I’ve been following the world of creating digital art since the dawn of home computing and the Commodore 64. ( I miss my Koala 64 ) So when I was asked by Animation Insider to do a short article on the various options available out there to today’s artist, I had an easy short list to share. It’s a fantastic time for gadget junkies, and people looking to invest in new hardware to create visual media. So many options are available, and technology is advancing so quickly, it’s a bit hard to keep up with it all. In this article, I’ll try to outline some of the many modern tablets I’ve used, and my suggestions for the cheapest entry point, to the most expensive. I’ve seen many technologies come and go, but over the years the gold standard for pressure sensitive tablets has been made by Wacom Inc. Being one of the originators of drawing technology for the computer, Wacom’s combination of hardware design, build materials, responsiveness & line quality has been second to none. No one out there has been able to build a wintab driver that supports pressure sensitivity in all applications, at least not one of any quality. That being said, having been noodling around with tablet hardware reviews for many years, occasionally I am sent a review unit which surprises me. The EasyPen F610E (er.. nice name?) 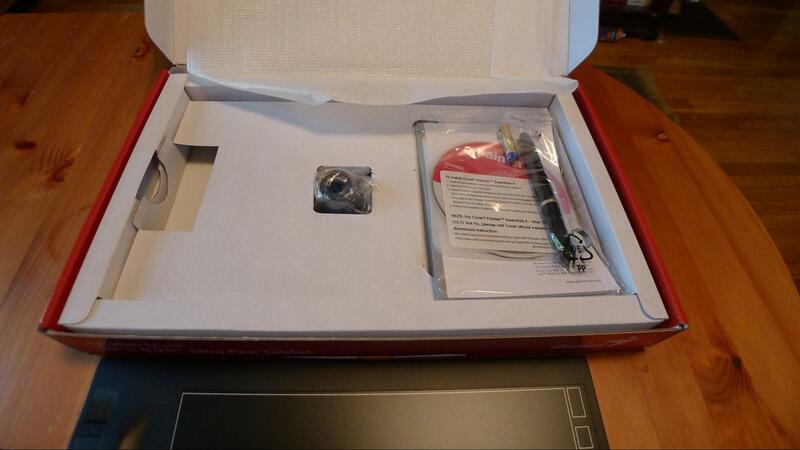 by Genius, arrives in an attractive red box, along with a copy of Painter 4 Essentials. Hey, bonus! I’ll take it.. although, Painter FOUR? I actually never installed the software. 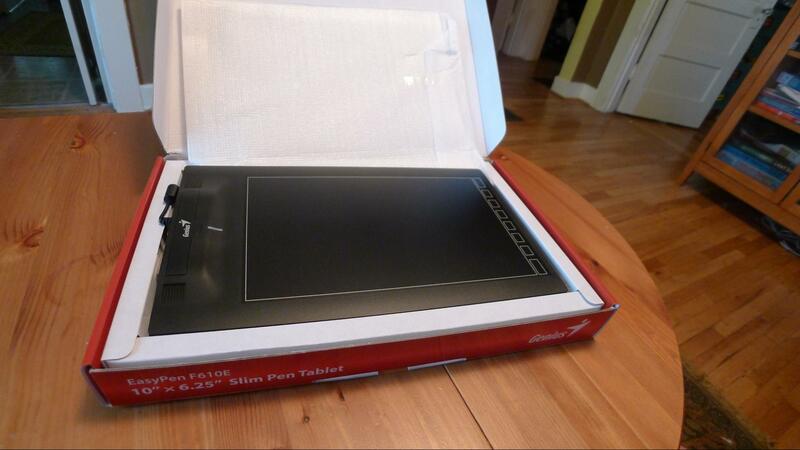 Opening the box, one finds the slim 10” x 6.25” Genius EasyPen tablet in black. It’s very light and flat. Almost too flat. Wacom’s products tend to be thicker, because they implement a good amount of radio frequency shielding, preventing jittery lines while drawing. Hmm.. we’ll see how well it does..
Further inspection shows a rubber and plastic pen dock, the driver, a copy of Painter 4 essentials, and the Genius two button pen, and a single AAA battery. The pen ships with tip refills, similar to a Wacom pen, although the tips feel like they’re made of much softer plastic, and don’t install quite as easily. Installing the battery into the pen. Everything bends slightly.. build quality isn’t fantastic here, in fact it feels very cheap. 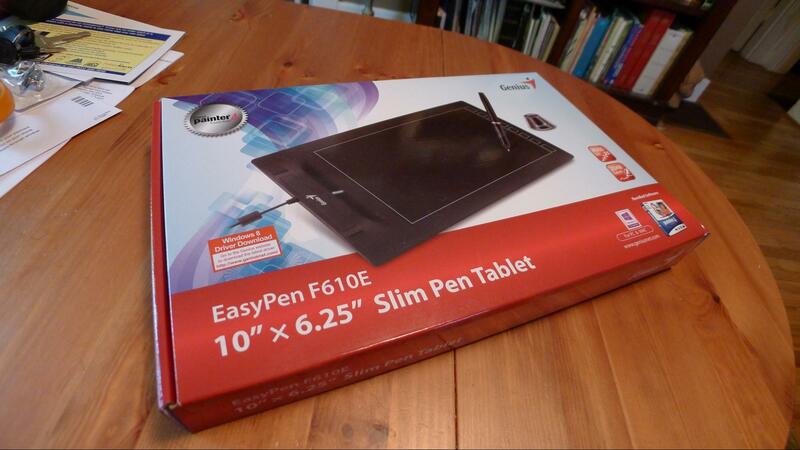 Everything about the Genius EasyPen F610E feels like a less than premium experience so far. The plastics used feel brittle and cheap to the touch.. but what about the drawing quality? 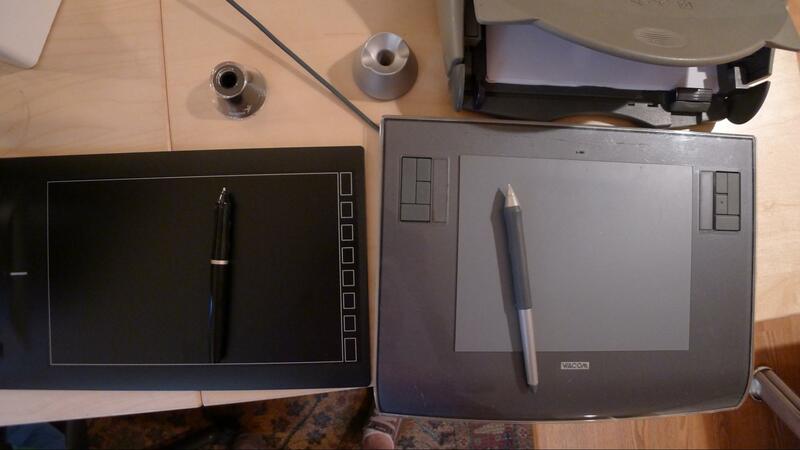 Side by side with my old Wacom Intuos 3 standalone tablet. 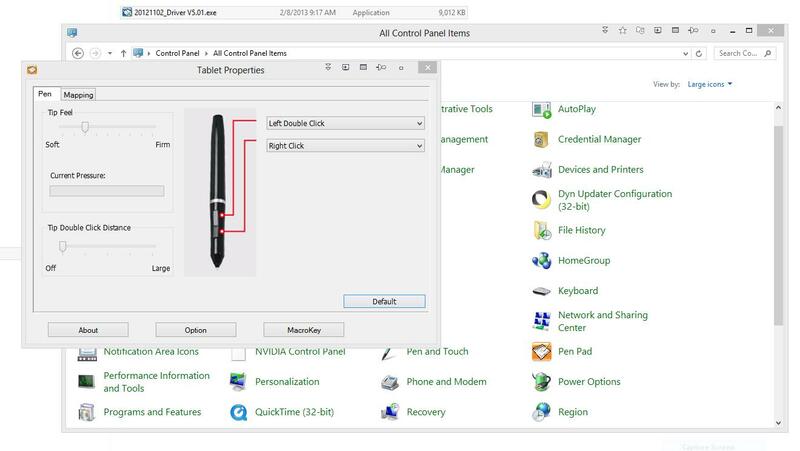 Installing the driver for the Genius Pen went off without a hitch..
And when finished, this generic icon for “Pen Pad” buried in the control panel, brings you to Genius Pen’s Tablet Properties configuration panel. Settings for customizing top and bottom pen buttons are there. Sadly you cannot map either of these buttons to switch dual monitors, as I do with my other Wacom tablets. 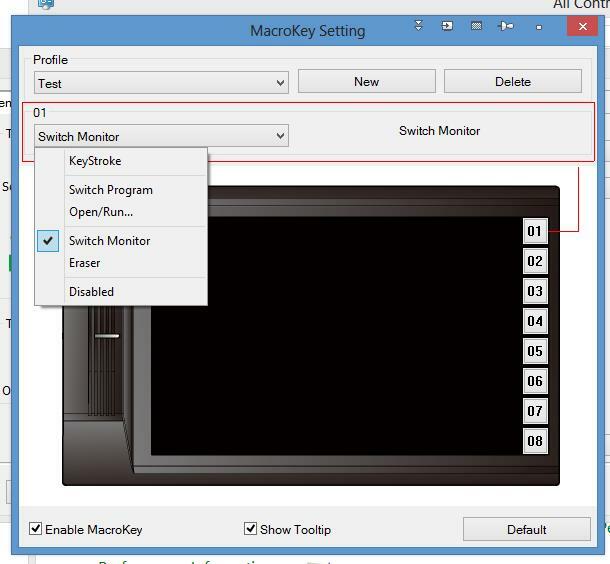 I was able to assign this in the MacroKey settings, the buttons along the side of the tablet which can only be pressed with the pen, not your finger. Job done. On to a drawing test..
Sketchbook Pro responded fairly nicely, with some shakiness in the line quality. I wasn’t sure if this was due to the USB cable being near other power sources, but overall the tablet had a slightly jittery feel compared to it’s Wacom equivalent. Zooming in while drawing helped quite a bit, and honestly the Genius Pen did a fairly good job overall. I’m not sure I would reccomend it for the serious professional, but for the casual hobbyist, at 84 bucks and dropping, how could you not pick one of these up? It’s the first time I’ve seen a company besides Wacom do pressure sensitivity across all of my applications, so well done on that front.. Paint Tool Sai ( Why are you kids crazy for the Paint Tool Sai? ) worked brilliantly. Full pressure supported. As well as Flash.. The Genius EasyPen F610E did better on vectors than it did on bitmaps, due to vector line smoothing..
All in all, not a bad tablet at all. Great job Geniuses at Genius. So you could have yourself a brand new Genius tablet or even a used Wacom Intuos 1, 2 or 3 tablet from Ebay for the same price. But what about actual TABLET tablets? Ever since Microsoft created the first Tablet PC’s, Wacom has been there as a hardware partner, and many of these great devices can be gotten for a song on Ebay, should you choose to go that direction. 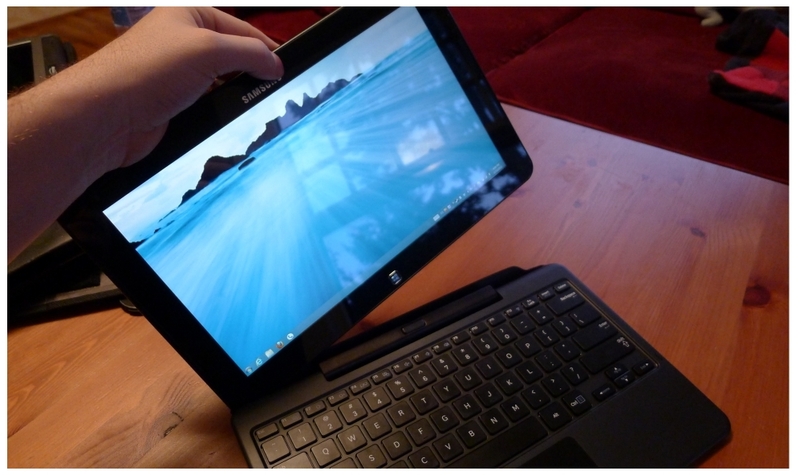 Some of the better used Tablet Pc’s out there that I’ve used have come from a company called Motion Computing. They cater to the medical industry quite a bit, but in years past had designed some of the most reliable and slim tablets out there, before the iPad came along.. They all included Wacom digitizers, making them a natural to stick in a backpack and carry around as a mobile drawing / animation solution..
My beloved old Motion Le1700. Still a fantastic machine. Motion also made a lower resolution Le1600, as well as a 1400. The 1600 was preferred by many, because it actually had lower resolution than the Le1700, believe it or not. I was always a pixel junky myself, needing more screen real estate for menus etc, but some liked it because they could actually read menus and text on those smaller screens. If you buy a Le1700 or Le1600, look for ones with a “view anywhere” display, and a core2 duo for a bit more speed. I had mine tricked out with 4 gb of ram, and an SSD drive, and it was quite the workstation for a long time. I may find myself going back to it yet. There are so many older tablet laptops out there with Wacom digitizers, I could hardly list them all. It really comes down to what you prefer, and the power / speed you need. Which brings us to the new mobile tablets.. If I were to pick a dark horse in the operating system wars, it would have to be Android. 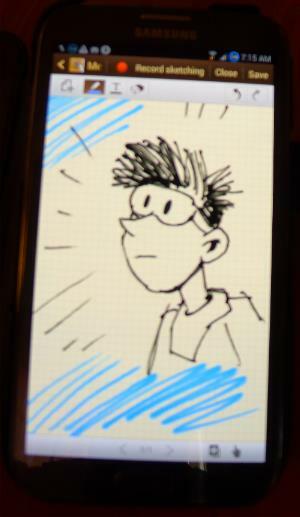 Using Samsung’s Wacom “S-Pen” on my phone is just crazy cool. Sketchbook Pro on the go is just fantastic to have as a quick drawing tool, and having a quad core device in my pocket with a large screen has been truly amazing. The variety of pressure sensitive drawing and animation software out there for Android is growing every day, and it’s a real pleasure to be able to use these little Wacom tablets on the go. Highly recommended. Samsung also makes a 10” Galaxy Note ( $300 – $400 USD) which in my opinion beats the iPad, for also sporting a pressure sensitive Wacom S-Pen. I’ve tried a demo unit and come very close to buying one. There’s even a full version of the professional animation software TVPaint available for Android. A full and direct port of a professional animation / image editing / and video editing suite on the go. Kind of blows the iPad out of the water in my opinion..
Samsung seems to be making the best hardware at the moment. My current tablet laptop is also being a Samsung. The Samsung 700t. But keep your pants on.. Samsung has just announced the Haswell chipset version of it’s Ativ line, the Ativ Q! A 3.3-inch, 3,200 x 1,800 slider that runs both Windows 8 and Android (4.2)! Be still my beating heart. This tablet ( With Wacom S-Pen!) sports the highest resolution on any mobile device or tablet I’ve ever seen. I’m sure there will be a premium price to pay for it as well. And finally my very short review of one of the most expensive options..
Wacom has really outdone themselves this time, with the Wacom 22HD Touch. Do you need touch? No. Is it nice to have? Yes. It’s early days yet, with most applications and touch. Windows 8 itself works well with palm rejection technology, (resting your palm on the screen while drawing, without making inadvertent lines on the screen) and there are several applications out there that make use of multitouch gestures, the best among them being the amazing ArtRage. This is everything you’ve come to expect from a Wacom product. Smooth, responsive, and amazing to work with. I actually prefer the 22 inch model to the 24 inch. I’ve owned both, and the 24 inch takes up far too much desk space, ships with a 70 lb stand (!) and is almost impossible to mount on a swing out arm, such as I’ve done with the 22hd. The 22hd is the natural wide screen progression from the older Cintiq 21UX. It’s light, has the same great rotating stand as the 21UX, and comes in both a touch screen, and non-touch screen options. There’s a slight war going on between Microsoft and well.. everyone else in the software world who uses the Wintab pressure specification. But Wacom’s latest driver for the Cintiq 22hd includes the option to turn off “windows ink” which allows certain software to work again, that had previously had problems with touch and pressure working together. ( Like Adobe Flash ) But that’s a future article all together.. I hope this article sparks some ideas on the available hardware out there, and the many choices available to todays digital artists. 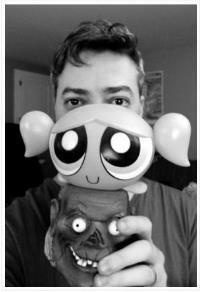 Chad Essley is an independent animation director and founder of CartoonMonkey Studio in the Pacific Northwest. He draws funny pictures for a living, obsesses over gadgets he doesn’t need, and hangs out with his cat way too often. Animation has changed rapidly in the past 25 years, from being exclusively hand drawn to computer programs that can create three dimensional worlds almost indistinguishable from our own. In the late 80s you’d see a technical director working alongside an animator at a workstation that cost much more than the average house. The software was either custom coded, or a combination of Alias for modeling and Softimage for animation at a cost of $30,000 each per seat. Flash forward to now and you’ll find a different landscape. The computers that you can buy at an office supply store are much more powerful than those old workstations and available for well under $1000, and you can spend anywhere from $8000 all the way down to free (!) to get software that will allow you to make anything from a commercial to a short to a feature film in the privacy of your own home. The differences between the software packages are many, and your decision on which one to use will depend on much more than just budget. Where one package may seem to have it all, your pipeline may require it to work with other packages. Also, you may not need all the bells and whistles of an animation package if your job mainly consists of motion graphics or architectural fly-throughs. So use this guide as a springboard to your own research. Ask yourself what you really need, and look at the various packages to see which one will be the best fit. Most of these programs have free versions of usually 30 days that you can download and “kick the tires” to see which works best for you, and links to the websites are provided. Nowadays, any discussion of 3D software begins with the 900 pound gorilla, Autodesk. Their original software 3D Studio, was a DOS companion to AutoCAD, built to bring architectural CAD drawings into the third dimension. Its advantage was that it could be run on PCs and was quickly adopted by the games market. Soon, those artists began hitting a wall on what they could do, and 3D Studio was given ground up re-write and released as 3DS Max. Meanwhile, Alias, seeing there was money to be made on the PC (as opposed to Silicon Graphics workstations) released Maya, and a rivalry was begun. Late to the party was Softimage, which was owned for a time by Microsoft, and because of a rewrite that took way too long, never got the traction that Max and Maya had. However, Autodesk decided to go on a buying spree and bought both Maya and Softimage, eliminating outside competition, and rebranded the packages for different markets. In recent releases, they are all built to work well together (and with other software) in various Entertainment Suite packages, which wind up being both expensive (up to $8000) and a bargain for the software you get. 3DS Max is great software for a small shop, as it’s “ready to go” for anything out of the box. Strong with its CAD roots, the Max and AutoCAD combination can take you from an architect’s drawings to realistic renders. But it doesn’t stop there: Max has one of the strongest modeling toolsets and a robust character animation system that makes it excellent for working on a range of projects and has been used in games, commercials, animated television series, and feature films all around the world. 3DS Max has been described as “an Operating System for a very wide range of plug-ins,” and there is a staggering amount of plug-ins and scripts that extend its power, from Fluid Dynamics programs to rendering engines. 3DS Max Demo Download – 30 Day free trial. Maya would seem to be the “go to” software for animation, as it’s used by everyone from Pixar to Dreamworks uses Maya to do their feature animation. However, the strength of Maya is its ability to let you get “under the hood.” If Maya doesn’t let you do exactly what you want it to do, you can open it up and supercharge it, using either MEL or Python scripting, or the extensive Software Development Kit to create your own tools. Maya is great for medium to large shops that are working with a complicated pipeline, where the software needs to be flexible enough to do exactly what you want it to do, and you have the programmers who can handle the job. If you’re a small shop that’s fitting into another organizations pipeline, Maya is also your choice. Maya, through its HumanIK also has a strong integration with Motionbuilder (also an Autodesk product) which is the standard for working with motion capture files. They are sold together in the Entertainment Suites and together make a powerful pair. Maya also has strong animation tools and an interface built for speed. The available plug-ins aren’t as extensive as those for Max, but there are good ones to be found, especially in the rendering department, where Pixar’s Renderman, and ChaosGroup’s vRay are available for tight integration with Maya. Maya Demo Download – 30 Day free trial. Softimage seems to have been pushed aside, but as it turns out, is far too powerful a program to completely let go away, especially given two of its components, FaceRobot – an extremely robust facial animation system with soft-tissue dynamics, and controls for lip-synching and emotions; and ICE, a visual programming language that lets you do anything from particle systems to rigging. As part of the Entertainment Suite, Softimage acts as a standalone plugin package for Maya and Max that is built to interact well with both. On its own, it is a strong modeling and animation package that interacts well with a host of other programs, including Pixologic’s zBrush (see below). Softimage Demo Download – 30 Day free trial. Another of the old guard animation programs, Lightwave 3D began as part of the revolutionary Video Toaster system on the Amiga (!). A very strong, yet relatively low cost piece of software, Lightwave 3D was widely used on television shows such as Babylon 5, the various Star Trek series, Battlestar Galactica (the new series), and feature films such as Star Wars, Sin City, 300 and Star Trek features. Lightwave 3D is actually two programs, a separate modeling and animation program that can update in realtime through a Hub program. This maximizes resources for whatever task you have at hand, and once you get used to it, is an excellent way to work. Lightwave has always had one of the best “out of the box” renderers, and the new version, 11.5 is no exception. It has excellent character animation tools and can easily provide feature quality animation for a reasonable price. Modo was built by a group of engineers who mutinied from Lightwave 3D and broke off and formed a new company. Said to be built “by artists, for artists” it sports one of the industry’s strongest and fastest modelers, with the ability to see your model instantly in a photorealistic, realtime renderer. Whereas programs such as Max and Maya have a scores of individual specialized tools, Modo has a smaller toolset that is customizable by the artist to create whatever tool is needed. Once you can wrap your head around this concept, it is possible to create top-quality work. ILM uses it as a concept development tool, proving its intuitive creative flow. The animation tools are also strong, and Modo is used in feature films like John Carter, District 9, and television shows like CSI, Fringe and True Blood, as well as a host of games and commercials you’ve no doubt seen. A robust Python scripting integration allows you to get even further under the hood, and a C++ Software Developer kit allows programmers to extend the program to meet your needs. The renderer is gorgeous, CPU based, and takes full advantage of multiple core processors. The more hardware you throw at it, the faster it gets. However, it doesn’t yet have GPU rendering support – currently a good and bad thing – good in that you don’t need to spend thousands on multiple GPUs for single-box rendering as one GPU and a good processor will still give you realtime feedback; bad in that you need to use more workstations for rendering. It becomes a budget consideration that you have to balance, but it’s a solid piece of software. Cinema 4d scored a big hit with its tight integration with After Effects in the current Adobe suite of products. They have a great way of selling the product: you buy what you need. If you’re a motion graphics guy, you most likely don’t need all the character tools to do motion graphics, so Cinema 4d has a Prime Version that’s made for that. Adding on features such as render nodes, realtime rendering, advanced Character Tools, hair, and particles, etc. will take you all the way up to the Studio Version. And you can start off from one version and upgrade to the extra-featured versions as your needs expand. Cinema 4D Demo Download – 42 Day Free Trial. Houdini has a great selection of modeling and animation tools, but it’s true power is that it has the most powerful effects and dynamics systems of any of the 3D packages. It’s used by everyone: Pixar, Weta, ILM, Sony, and others to create the explosions and effect that highlight blockbuster features. Using a node-based, procedural workflow, Houdini makes complex interactions of objects and particles, easy, intuitive and repeatable. You can build a library of particle and dynamics systems that you can plug into your scenes, allowing you to quickly create magic and still stay within your deadlines and budgets. Blender is insane. Completely. You get a full 3D software package that includes modeling, animation, rendering, compositing, video editing, and a game engine for free. That’s right. Free. Not a thin dime. Not a sausage. Blender is Open Source software, overseen by the Blender Foundation in the Netherlands, and developed by a community of programmers and animators all over the world. Because of this, they work fast – features that take time to appear in other packages show up here quickly. On the other hand, that doesn’t mean that the implementation is necessarily good, or right for your situation. It doesn’t play well with others, in that importing animation from another package is tricky. It hasn’t been tested as much in production as any of the other software packages, so you might be taking a chance on getting your work out. But. They have created their own productions – ranging from animations to games, to VFX demos – to highlight their work, and heavily documented what and how they did it. And supplied all the files for those works, up to and including 4K (!) renders. And supplied the source code for the program itself, so anyone can go in and see how it was done, and if they can figure out a way to do it better, send it in for a later iteration of the program. And on the other other hand (back to the first hand?) you get a killer piece of software. A modeling and animation system that works for everything from motion graphics to character animation. A killer renderer that’s blazing fast and runs on as many GPUs as you can throw at it. A particle system for your effects needs. And the ability to put it in front of your artists by clicking the link below. Scott Jenkins has been animating on the computer since 1988 and has worked as a freelancer in games, television, and Location Based Entertainment. He has professionally used most of the software listed in this article and has used the rest in hobby work. Since the dawn of the digital 2D revolution, there’s been much heated debate on which software is more user friendly, produces better quality work, and has a better price. While some brands offer more functions and features, they come a pretty high cost and you might not use all of the application’s resources. Then there are some brands that offer a very intuitive experience while chiming in at a very low price tag. 3. Toon Boom Studio is another all-in-one animation package geared towards animation fans, students, teachers and hobbyists. At $190 per seat, you’ll get access to tech support and other “member” features, which makes it a pretty good entry level piece of software. Although some of these apps have some big names behind them, that doesn’t always mean that it’s the right tool for you. The phrase; “TV show and Feature Films are made with them…” is really just a marketing ploy to get artists and animators to break out the plastic. What does a good tool feel like? Well, it depends. Personally speaking, I like using software that allows me to focus on what’s in front of me without having to constantly reach for a hotkey or move a bunch of panels around just to get some more screen real estate. Even though many applications say their an all-in-one, you have to raise the question on whether you really need all those features and how often are you going to use them. In a studio setting, you’ll only be using the app for one purpose and the rest gets sent to another person or department. The pros know that having good tools will help you produce good work, but they won’t do the work for you. For your consideration: The software and hardware you buy for your business is an investment which should pay itself off. Now, that doesn’t give you a license to spend carelessly. You really need to consider if the amount of work you’re bringing in can justify the hefty spending on name-endorsed products. If you can, go for it. But if you can’t, try to see if you can make do without for a while. Most clients don’t care what you do the work in so long as the work is done and you keep them happy.